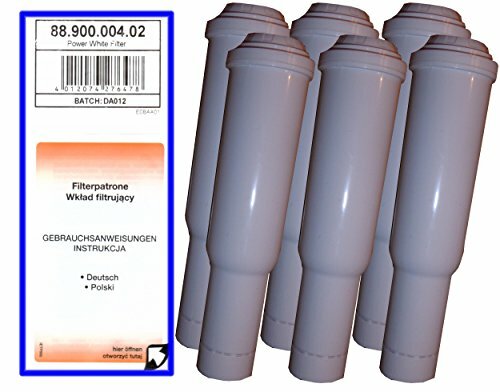 the filter is compatible with pure organic Material (without chemical additives and is filled in) According to the professional flow principle, i.e. the Wasserfilterung shall only the cover. for all models of the Jura Impressa SUBITO, Nespresso N90 Series For 50 litres of water Maximum 2 months or pure organic, there are no chemical additives and reduces geschmacks.- geruchsstörende substances as E. G. Chlorine and limescale, schwermetalle. Jura IMPRESSA Z5 (Chrome / Alu) and Jura IMPRESSA Z5 @1 2 Chrome (aluminium) in the Jura IMPRESSA Jura IMPRESSA Jura IMPRESSA J5 S9 One Touch, F70 13369 Art., F50 ²) and Art. 13969 in the Jura IMPRESSA C9 One Touch Platinum² (art. 13344) in the Jura IMPRESSA C5 ² (Art. 13307 13305 Art. 13479, and) in the Jura SUBITO. shall apply to all equipment with a production date prior to or for the all of 14.10.2009 the Jura coffee machine which a Juria Claris Water Filter White the Jura-Welcome Packbeilag.